The parotid gland is a primarily serous salivary gland that is located high in the neck in the preauricular area extending towards the cheek. The extratemporal facial nerve and its branches pass through the parotid gland and supply motor innervation to the muscles of facial expression, as well as to the postauricular muscles, the posterior belly of the digastric muscle, and the stylohyoid muscles. The motor branches to the face are divided into cervicofacial and temporofacial branches, with the former supplying the muscles of the mouth and neck and the latter supplying the muscles of the forehead and eye (there is some overlap in the nasal region). There is no anatomic feature that formally separates the parotid gland into superficial and deep lobes, but the plane of the facial nerve (see the image below) generally serves for demarcation of the superficial and deep portions of the gland. The surgical anatomy and landmarks of the facial nerve. Surgical landmarks to the facial nerve include the tympanomastoid suture line, the tragal pointer, and the posterior belly of the digastric muscle. The tympanomastoid suture line lies between the mastoid and tympanic segments of the temporal bone and is approximately 6-8 mm lateral to the stylomastoid foramen. The main trunk of the nerve can also be found midway between (10 mm posteroinferior to) the cartilaginous tragal pointer of the external auditory canal and the posterior belly of the digastric muscle. The nerve is usually located inferior and medial to the pointer. For more information about the relevant anatomy, see Facial Nerve Anatomy. 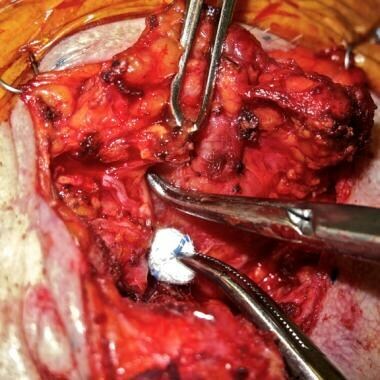 A superficial (or lateral) parotidectomy involves removing all of the gland superficial to the facial nerve, whereas a partial superficial parotidectomy involves removing only the portion of the gland surrounding a tumor or mass. In a partial superficial parotidectomy, only some branches of the facial nerve are usually dissected, whereas in a formal superficial parotidectomy, the entire cervicofacial and temporofacial divisions are dissected. For a total parotidectomy, the superficial gland is dissected free of all of the facial nerve branches to the extent feasible, and the branches are then completely mobilized and the deep portion of the gland removed. Many deep lobe or parapharyngeal parotid tumors can be approached transcervically rather than by means of parotidectomy; however, this transcervical technique is not discussed in this article. Neoplasms are the most common indication for parotidectomy. The vast majority of primary parotid tumors are benign, but approximately 20% are found to be malignant. In addition, regional and distant disease can metastasize to the parotid and necessitate removal for diagnosis or cure. Inflammatory processes (eg, chronic parotitis, deep salivary calculi, or parotid abscess) are occasionally treated with total parotidectomy, with the recognition that surgery in an inflamed gland probably carries a higher risk of postoperative facial nerve dysfunction. Salivary duct stones may be approached through minimal external paortid incisions, and are aided by sialendoscopy when possible. For further information on the workup and treatment of parotid sialadenitis and calculi, see Parotitis. Sialorrhea is rarely treated with parotidectomy; more often, it is medically managed with antisialagogues or botulinum toxin or treated with duct ligation. Patients with benign tumors who are at high anesthetic risk may be observed on a case-by-case basis. Positive identification and preservation of the facial nerve are essential for preventing inadvertent facial nerve injury. 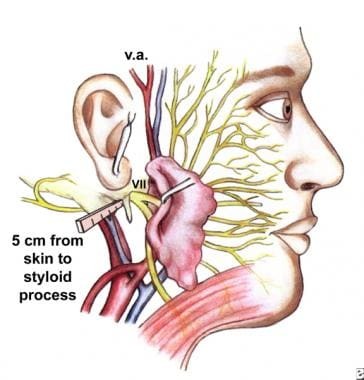 A thorough understanding of the anatomy of the stylomastoid foramen, the facial nerve, and the parotid gland and its surrounding structures underlies identification and preservation of the nerve. Whenever possible, a normal cuff of parotid tissue should be resected around a tumor to prevent recurrence. In the setting of a benign tumor, if a facial nerve branch is found directly on the tumor capsule, the nerve should be gently dissected off the tumor. In the setting of a malignancy, consideration should be given to sacrificing as opposed to preserving the nerve (see Technique). Raw gland surface contributes to postoperative salivary leakage (sialocele or salivary fistula). In addition, raw gland apposed to skin provides a ready pathway for postganglionic parasympathetic fibers to migrate from the salivary tissue and cross-innervate facial sweat glands, resulting in gustatory sweating (Frey syndrome). Efforts should be made to close the parotid capsule after removal of a parotid tumor or a portion of the gland. If closure of the capsule is not feasible, consideration should be given to interposing tissue (eg, dermal fat graft)  or implantable biologic material (eg, acellular dermis) between the raw gland and the skin. Injury to the posterior branch of the greater auricular nerve, which supplies sensation to the ear, is often avoidable. If the nerve must be cut, it can be marked with a stitch to facilitate reapproximation at the conclusion of the case. Patients should be warned to expect at least temporary earlobe numbness and should take precautions to prevent heat or cold injury to the insensate area (eg, frostbite or curling iron burns). Closed suction drainage is used in most cases to prevent postoperative hematoma or seroma. Measures that may be considered before parotidectomy include diagnostic imaging, fine-needle aspiration (FNA), neck dissection, and antibiotic prophylaxis. Both computed tomography (CT) and magnetic resonance imaging (MRI) can be helpful in operative planning, but they may not be necessary in patients with small, mobile tumors of the parotid tail. Any clinical feature suggestive of malignancy (eg, lymphadenopathy, fixation to surrounding structures, or preoperative facial nerve weakness) warrants radiographic evaluation of the parotid gland and nodal basins in the neck. Imaging can provide useful clues to the relation between the tumor and the facial nerve. If the tumor lies in a plane inferior to the stylomastoid foramen, the nerve will probably lie on the superior surface of the tumor; likewise, if the tumor is high in the gland, the nerve may pass inferiorly. If the tumor occupies the most superficial portion of the gland, with a significant area of parotid tissue deep to it, the nerve is likely to be deep to the tumor (see the image below); similarly, a deep tumor abutting the mandible should have the nerve on its superficial surface. 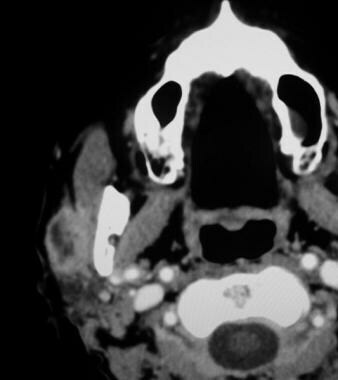 Axial contrast-enhanced CT scan demonstrating mass in right parotid. Mass extends to superficial surface of gland, but uninvolved parotid is seen between mass and mandible. Facial nerve would likely be found deep to mass in this situation (and was in this patient). Image courtesy of Dr. Alexander Langerman. It should be kept in mind, however, that these statements represent general tendencies, not ironclad laws. They should not be used as substitutes for proper intraoperative identification of the facial nerve. FNA can be used to diagnose parotid tumors preoperatively with a high degree of sensitivity and specificity. With small, mobile tumors of the tail of the parotid, preoperative histologic diagnosis may not be required, but even in this setting, such diagnosis can contribute to patient counseling and informed consent. The use of perioperative antibiotics is controversial and may not be necessary in cases where no infection exists before the operation. The authors typically give only 24 hours of a first-generation cephalosporin but administer antibiotics more liberally if an implantable biological material such as acellular dermis is used. In most patients, closed suction drains are removed once drainage minimizes, but the authors empirically maintain the drains for longer (about 7 days) if acellular dermis was used. Some surgeons use a facial nerve monitor to facilitate identification of the facial nerve. This device consists of electromyography (EMG) electrodes that are placed, at a minimum, in the orbicularis oris and the orbicularis oculi. Stimulation of the cervicofacial and temporofacial divisions of the facial nerve causes the respective muscles to contract. In addition to the stimulation inherent in manipulation of the nerve, a probe can be connected to the monitor to permit direct stimulation of suspected nerve branches. The facial nerve can also be monitored through simple observation of facial twitching, although such monitoring requires a vigilant observer during facial nerve dissection. When identification of the facial nerve is in question, the nerve can be directly stimulated with a handheld nerve stimulator to elicit twitching. Parotidectomy is typically performed with the patient under general anesthesia. To allow adequate monitoring of the facial nerve, paralytics should not be used beyond the induction of anesthesia. It is important to confirm that the patient has regained full motor function (as determined by twitch monitoring) before attempting to dissect out the facial nerve and its branches. The patient is placed in the supine position with the head turned as far as possible away from the side of the operation. A shoulder roll can help with neck extension and thereby facilitate surgical exposure. The eye on the side to be operated on is lubricated and closed with either a transparent dressing (the authors' preference) or a fine suture that approximates the lids (the so-called tarsorrhaphy stitch). If continuous facial nerve monitoring is to be performed, monitoring electrodes are placed (at a minimum) in the orbicularis oris and the orbicularis oculi, and grounding electrodes are placed outside the field. Incisions are marked (see Technique), and local anesthetic with epinephrine is injected into the skin. The face may be covered in a transparent dressing or may be prepared, with particular care taken around the eyes and mouth. The authors prefer using a transparent dressing to allow the eye, nose, and mouth on the side of surgery to be fully visualized without risk of contamination. The remainder of the operative field is prepared, including the temple, the ear, the preauricular and postauricular areas, and the neck. A cotton ball can be placed in the ear canal during prepping to prevent cleaning solution from collecting and causing postoperative irritation (if cleaning slution does get into the canal, it should be washed out with room temperature water or saline at the conclusion of the procedure). Follow-up is based on the pathology of the tumors, with malignant tumors requiring longer and closer monitoring. Patients with facial nerve weakness should be regularly monitored for complications and watched for improvement or stabilization; plans should be made for reanimation as necessary. If a mass develops lateral to the sternocleidomastoid in the location of the greater auricular nerve, a greater auricular neuroma should be considered. Such masses tend to be painful with manipulation. In the setting of benign disease, reassurance or treatment are both reasonable. Confirmation of this diagnosis via FNA or removal should be considered in the setting of a previous malignancy. Incisions should be camouflaged in normal facial contours. Postauricular and neck incisions are designed to produce flaps with a broad base to avoid long, sharp corners, which are prone to decreased blood flow and skin necrosis. The position of the earlobe should be precisely marked for repositioning at the conclusion of the case. Positive identification and preservation of the facial nerve are essential to prevent inadvertent facial nerve injury. An expert in parotid surgery is an expert in facial nerve anatomy. Any raw gland surface remaining at the conclusion of the procedure should be covered to prevent salivary leakage and minimize the risk of gustatory sweating (Frey syndrome). Parotidectomy is performed as follows. 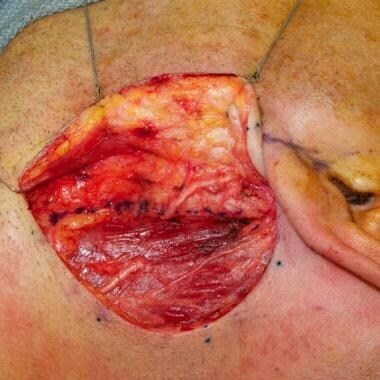 Skin incisions are placed with consideration of whether a neck dissection is necessary (see Periprocedural Care). The anterior skin incision can be placed either in the preauricular crease or posttragally, in the manner of a facelift  (see the image below). Cosmetically guided parotidectomy incision, designed pretragally. Dotted line identifies hairline. 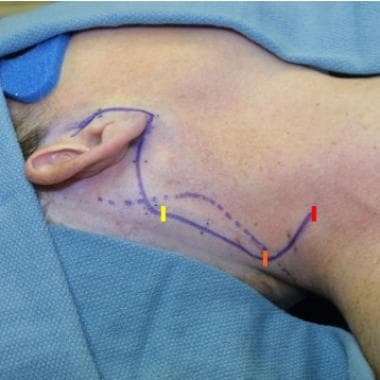 Incision is carried postauricularly to yellow mark for small mass removal, to orange mark for larger operation, and to red mark if neck dissection is included. Note that earlobe position has been marked with dots of methylene blue. Image courtesy of Dr. James Netterville. 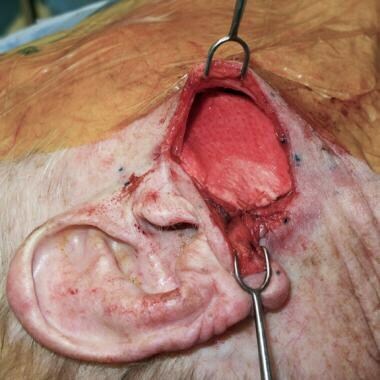 The earlobe position is marked, and the incision is continued posteriorly under the earlobe with an adequate cuff of skin to prevent tethering of the lobule and a pixie-ear deformity. The incision continues for a variable distance posteriorly and may be extended into the hairline for cosmesis or curved down to a prominent neck crease to allow a neck dissection. After the patient is prepared as described previously and incisions are made, an anterior subplatysmal/subsuperficial musculoaponeurotic system (SMAS) flap is made by using the natural plane on the surface of the parotid gland. This incision is carried beyond the extent of the tumor to completely expose parotid fascia anterior to the tissue to be removed. Great caution is exercised in approaching the zygomatic arch, the anterior border of the parotid gland, and the submandibular fascia, all of which are areas where distal branches of the facial nerve emerge from the gland. A posterior flap is then raised at the level of the sternocleidomastoid (SCM) fascia. At the uppermost end of the SCM, some muscle fibers insert into the skin; these must be transected. The greater auricular nerve branches and the external jugular vein are identified, and the plane is developed superficial to these structures. At this point, if necessary, the anterior branch of the greater auricular nerve is transected sharply and tagged for reanastomosis. The proximal end is left enveloped in SCM fascia to facilitate reapproximation at the end of the case (see the image below). It is often necessary to ligate the external jugular vein. Greater auricular nerve has been transected near junction of parotid gland and sternocleidomastoid (SCM). Junction is marked with dotted line. Proximal nerve is left enveloped in fascia of SCM to aid in reapproximation at end of case. Posterior branch of greater auricular nerve can be seen crossing SCM more superiorly and was left intact. Image courtesy of Dr. Alexander Langerman and Dr. James Netterville. The tail of the parotid gland is elevated off the SCM until the posterior belly of the digastric muscle is seen. During this maneuver, one should watch for the small nerve branch to the posterior belly of the digastric muscle, which is not always seen but can provide a clue to the location of the facial nerve. More important in this area is to avoid the cervical and marginal branches, which usually pass over the facial veins and in the submandibular fascia. If the main trunk is to be identified, the posterior gland is then separated from the cartilage of the tragus and the external auditory canal, with care taken to preserve the perichondrium. This elevation is continued deep to the bony-cartilaginous junction. Once this step is accomplished, attention is turned to identification of the facial nerve. The basic principle of facial nerve dissection is to avoid any unnecessary stimulation of the nerve. Specific tools used in dissection vary from surgeon to surgeon and include cold, bipolar electrocauterization, and ultrasonic dissection. Most surgeons caution against the use of a monopolar cautery in close proximity to the facial nerve. If complete dissection of the nerve is planned, once the main trunk is identified it is traced to the pes anserinus, the structure marking the separation of the cervicofacial (lower) and temporofacial (upper) divisions (see the image below). Main trunk of facial nerve (asterisk) has been exposed to pes anserinus, branch point of upper (U) and lower (L) divisions. Image courtesy of Dr. Alexander Langerman. Smaller branches are then followed carefully with the aim of mapping their relation to the tumor. The typical approach is to start at the uppermost branch of the upper division or the lowermost branch of the lower division, as appropriate, and follows the branch out to a point where it is well clear of the tumor. The next branch is then followed, and so forth, until all branches in the area of the tumor are dissected free and the tumor is mobilized for removal. A common technique for nerve dissection is to use a small, fine hemostat or a nonlocking, smooth-jawed, right-angle dissector (McCabe facial nerve dissector) to gently elevate the parotid tissue in the natural plane just superficial to each nerve. The tissue lateral to and between the tines of the instrument is sealed with a bipolar cautery and divided, and the process is continued. Very cautious and gentle traction of the nerve can be accomplished with gauze held in a forceps (see the image below). Branch of facial nerve is dissected in natural plane just superficial to nerve with McCabe dissector. Gentle back traction is applied with small gauze sponge, and free gland is pulled away by clamp to provide forward traction. Image courtesy of Dr. Alexander Langerman. In the setting of malignancy, especially if preoperative facial nerve dysfunction is present, consideration is given to severing the nerves involved with the tumor and tagging them with nonabsorbable sutures for interposition or other grafting as appropriate either at the conclusion of the tumor removal or at a later time. Facial nerve repair and rehabilitation techniques are discussed elsewhere (see Facial Nerve Repair). If the whole gland is to be removed and not just the cuff of gland around the tumor, all of the facial nerve branches are dissected and mobilized, and the deep parotid tissue is then removed from between the branches. If a tumor must be removed from the deep lobe via a lateral approach (as with a tumor invading between nerve branches from the superficial lobe), some authors advocate selective division of some nerve branches with immediate reanastomosis after tumor removal to avoid stretching branches and causing permanent dysfunction. Once tissue removal is complete, the facial nerve can be tested with a handheld stimulator or monitor probe to confirm that it is unharmed. Repeated unnecessary stimulation of the nerve, however, is to be avoided out of concern for potential injury. After the patient is gently awakened and has recovered from anesthesia, the face is examined for motor nerve function. If the facial nerve was not identified as intact and the patient wakes up with a dense paralysis that persists beyond the effects of any local anesthetic, reexploration should be considered. If the nerve is known to be intact, the patient can be reassured that mild postoperative facial nerve weakness will usually resolve completely. Once the resection is complete and any necessary repair or grafting of the facial nerve has been performed, attention is turned to closure. The primary goals of reconstruction are (1) to cover any raw gland surface remaining, (2) to restore normal facial contours, and (3) to provide coverage of the facial nerve and a reliable plane of dissection in the event that reoperation proves necessary. Many techniques are used for reconstruction. In small resections, the parotid capsule can often be closed primarily. In larger resections, the defect can be filled with autologous buccal or abdominal fat  (see the first image below) or acellular dermis (see the second image below). Abdominal fat with attached dermis has been implanted in parotidectomy defect. Fat maintains bulk well over time if handled atraumatically, and dermis allows closure of capsule. Image courtesy of James Netterville and Alexander Langerman. Rolled acellular dermis used to fill small defect after removal of parotid tumor. Image courtesy of James Netterville and Alexander Langerman. The digastric muscle can be cut at the intermediate tendon and the posterior belly rotated into the defect, or a superiorly based flap that includes a portion of the SCM can be used in a similar manner. However, muscle reconstruction tends to lose volume over time. In massive resections involving removal of mandible or skin, options include skin (eg, cervicofacial), myocutaneous (eg, pectoralis major), and free flaps. To reconstruct the greater auricular nerve, the fascia next to the opposing ends of the cut nerve are sutured together to allow tension-free neurorrhaphy. Interrupted 8-0 or 9-0 nylon sutures are then placed in the perineurium to reapproximate the nerve. If the nerve cannot be reapproximated, some authors advocate clipping or burying the proximal end to prevent neuroma formation, although evidence for the effectiveness of these techniques is lacking. Once reconstruction is complete, closed suction drains are placed through stab incisions in the posterior neck or hairline. The skin is then closed in layers in an interrupted fashion. To prevent a pixie-ear deformity, care is taken not to put excessive tension on the earlobe. Potential complications of parotidectomy include facial nerve injury, Frey syndrome, salivary leakage, ear numbness, facial asymmetry, flap necrosis, and tumor recurrence. If the motor supply to the orbicularis oculi is weak or absent, aggressive eye care must be instituted to prevent corneal drying and injury. Such care includes the use of lubricants, taping the eye shut at night, and moisture chambers during the day. Consultation with an ophthalmologist may be warranted. If long-term paralysis occurs, static facial rehabilitation techniques may be used, including brow lift, gold weight insertion and canthoplasty, and facial slings. Dynamic techniques or nerve repair may also be appropriate. The incidence of Frey syndrome may be correlated with the amount of gland removed. It has been suggested that the greater the quantity of parotid tissue removed, the greater the amount of raw surface available to provide aberrant innervation to the skin. To minimize this risk, the authors make an effort to interpose gland capsule, autologous tissue, or implantable biologic material between the gland and the skin. If Frey syndrome develops, various interventions may be employed, including topical application of antiperspirant, injection of botulinum toxin, and surgical interposition of tissue (eg, temporoparietal fascia or SCM) or implantable material (eg, acellular dermis). Surgical approaches carry the risks associated with reoperative surgery but are usually effective in minimizing or eliminating Frey syndrome. Conservative measures include drainage of sialoceles with pressure dressings. Salivary fistula can be treated with local wound revision if low-flow leakage is present. Botulinum toxin, by blocking the release of acetylcholine from postganglionic parasympathetic fibers, results in decreased salivary flow and has been reported to be remarkably effective in several small series. [16, 17, 18] Recalcitrant salivary leakage may necessitate surgical reexploration. Hypoesthesia in the distribution of the greater auricular nerve occurs in almost all patients undergoing parotid surgery. The numbness lessens over time in some patients. Its incidence may be reduced by making efforts to preserve the greater auricular nerve. When the greater auricular nerve must be sacrificed, the authors perform neurorrhaphy at the conclusion of the case whenever possible. The significance of the defect and the resulting facial asymmetry after parotidectomy is related to the amount of gland removed and the thinness of the patient. Patients with more subcutaneous fat may be better able to hide small defects than thin patients are and therefore may not require reconstruction. The authors tend to reconstruct most defects if potential asymmetry is a question. Acellular dermis, rolled and implanted in the defect, can both reconstruct normal facial contours and serve to close the parotid capsule and cover raw gland surface. Appropriate design of skin incisions can minimize distal flap necrosis. If flap necrosis does occur, appropriate topical care and reassurance are usually all that is necessary. Parotid tumors can recur as a result of positive margins, microsatellite disease, or unrecognized nerve invasion. A full discussion of the different parotid tumors, the extent of parotid surgery, and the need for postoperative radiation is beyond the scope of this article. A few basic principles should be followed to ensure adequate extirpation and minimize recurrence. Motamed M, Laugharne D, Bradley PJ. Management of chronic parotitis: a review. J Laryngol Otol. 2003 Jul. 117(7):521-6. [Medline]. Dave SP, Pernas FG, Roy S. The benign lymphoepithelial cyst and a classification system for lymphocytic parotid gland enlargement in the pediatric HIV population. Laryngoscope. 2007 Jan. 117(1):106-13. [Medline]. Witt RL. The significance of the margin in parotid surgery for pleomorphic adenoma. Laryngoscope. 2002 Dec. 112:2141-54. [Medline]. [Full Text]. Honeybrook A, Athavale SM, Rangarajan SV, Rohde SL, Netterville JL. Free dermal fat graft reconstruction of the head and neck: An alternate reconstructive option. Am J Otolaryngol. 2017 May-Jun. 38:291-296. [Medline]. [Full Text]. Kawata R, Koutetsu L, Yoshimura K, Nishikawa S, Takenaka H. Indication for elective neck dissection for N0 carcinoma of the parotid gland: a single institution's 20-year experience. Acta Otolaryngol. 2010 Feb. 130(2):286-92. [Medline]. Emerick KS, Fabian RL, Deschler DG. Clinical presentation, management, and outcome of high-grade mucoepidermoid carcinoma of the parotid gland. Otolaryngol Head Neck Surg. 2007 May. 136(5):783-7. [Medline]. Grosheva M, Klussmann JP, Grimminger C, Wittekindt C, Beutner D, Pantel M, et al. Electromyographic facial nerve monitoring during parotidectomy for benign lesions does not improve the outcome of postoperative facial nerve function: a prospective two-center trial. Laryngoscope. 2009 Dec. 119(12):2299-305. [Medline]. Sood AJ, Houlton JJ, Nguyen SA, Gillespie MB. Facial nerve monitoring during parotidectomy: a systematic review and meta-analysis. Otolaryngol Head Neck Surg. 2015 Apr. 152 (4):631-7. [Medline]. Meier JD, Wenig BL, Manders EC, Nenonene EK. Continuous intraoperative facial nerve monitoring in predicting postoperative injury during parotidectomy. Laryngoscope. 2006 Sep. 116(9):1569-72. [Medline]. Bianchi B, Ferri A, Ferrari S, Copelli C, Sesenna E. Improving esthetic results in benign parotid surgery: statistical evaluation of facelift approach, sternocleidomastoid flap, and superficial musculoaponeurotic system flap application. J Oral Maxillofac Surg. 2011 Apr. 69(4):1235-41. [Medline]. Koch M, Zenk J, Iro H. Long-term results of morbidity after parotid gland surgery in benign disease. Laryngoscope. 2010 Apr. 120(4):724-30. [Medline]. Lydiatt DD. Medical malpractice and facial nerve paralysis. Arch Otolaryngol Head Neck Surg. 2003 Jan. 129(1):50-3. [Medline]. Curry JM, King N, Reiter D, Fisher K, Heffelfinger RN, Pribitkin EA. Meta-analysis of surgical techniques for preventing parotidectomy sequelae. Arch Facial Plast Surg. 2009 Sep-Oct. 11(5):327-31. [Medline]. de Bree R, van der Waal I, Leemans CR. Management of Frey syndrome. Head Neck. 2007 Aug. 29(8):773-8. [Medline]. Marchese-Ragona R, Marioni G, Restivo DA, Staffieri A. The role of botulinum toxin in postparotidectomy fistula treatment. A technical note. Am J Otolaryngol. 2006 May-Jun. 27(3):221-4. [Medline]. Vargas H, Galati LT, Parnes SM. A pilot study evaluating the treatment of postparotidectomy sialoceles with botulinum toxin type A. Arch Otolaryngol Head Neck Surg. 2000 Mar. 126(3):421-4. [Medline]. Ellies M, Gottstein U, Rohrbach-Volland S, Arglebe C, Laskawi R. Reduction of salivary flow with botulinum toxin: extended report on 33 patients with drooling, salivary fistulas, and sialadenitis. Laryngoscope. 2004 Oct. 114(10):1856-60. [Medline]. Disclosure: Serve(d) as a director, officer, partner, employee, advisor, consultant or trustee for: ExplORer Surgical<br/>Have a 5% or greater equity interest in: ExplORer Surgical. Disclosure: Received royalty from Medtronic for other.